Orange County Executive Steven M. Neuhaus announced on Friday that Santa’s Toy Box, the annual toy drive for disadvantaged children in Orange County, will begin collecting donations of new toys and games over Thanksgiving weekend and continue through December 21st. Donations will be distributed to families in Orange County via organizations such as the Farmworkers Community Center, and the Emergency Housing Group. Santa’s Toy Box has been in operation for 33 years and is sponsored by the Orange County Department of Parks with invaluable assistance from New Winds Opportunity Center and Rehabilitation Support Services. 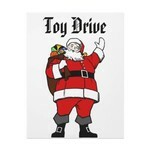 For more information about the toy drive, contact Tom Quinlisk at 457-4910 or TQuinlisk@orangecountygov.com. You can also visit the County’s Parks and Recreation website at Orangecountynyparks.com for details about Santa’s Toy Box and other holiday programs and events offered.